Layering your clothing to stay warm is a classic and still works very well. Some basics on the different layers, and how to maximise their function in order to stay warm while minimising the weight of the clothing, is what this chapter is about. A thin merino wool baselayer and a wonderful view down Napequa Valley, Glacier Pk area, WA, USA. Different clothing, from only baselayer on the left to Primaloft insulated jacket on the right. From left to right: Brian Doble, Mike Clelland, Ryan Jordan and Don Wilson geared up for a late, late fall trek in the Beartooth Absaroka Wilderness, MT, USA. The middle layer or warm layer can also be windproof, like this BPL Cocoon Pullover with synthetic insulation. Easy to put on outside a shell, but warmer if it is underneath a shell. 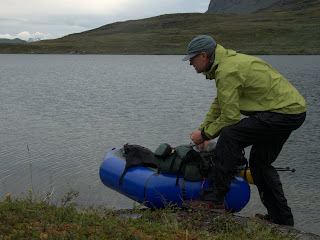 The outer layer, or shell, protects against wind, and can be a windshirt like this one, on a windy day above Lake Vastenjaure, Lapland, Sweden..
Readying the packraft, with the smell of rain on the wind. This usually calls for a waterproof shell; rain jacket and rain pants. Lake Bieggaluoppal, Lapland, Sweden. Comments and new insights Understanding the function of different layers of clothing is very important to stay reasonably comfortable no matter what the weather. I am constantly adjusting my clothing and learning new things. This chapter in the book is vital in order for readers to be able to evaluate different types of garments and to stay one step ahead of the marketing hype. The different clothes themselves are also discussed at length in their own chapters.